Impatient for Jeff Lemire's relaunch of a Moon Knight series and hearing a bit of a fan push to have Netflix take on this character, I decided to read up on the character, going instead for another highly recommended Moon Knight title Charlie Huston's 2006 run, starting with the collected volume one, The Bottom. This was... not a comfortable read. It's dark, and I can see why Netflix would be a good home, especially given their successfully dark (and fantastic) go at Jessica Jones and Daredevil. It's so dark that I'm kind of shocked it wasn't published under Marvel's MAX line, home of their more adult and grittier comics. Finch seems to love drawing blood splatters and in one scene Moon Knight cuts off a guy's face. But I can do dark. 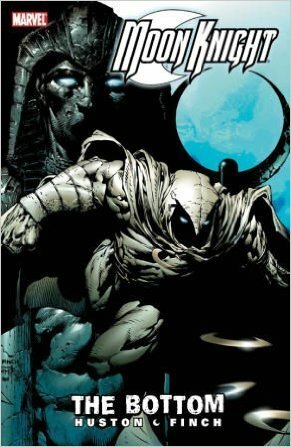 The uncomfortable part comes in the idea of Moon Knight as a hero. In the Bottom, we see the character at his worst. He's wallowing in self pity and has alienated everyone, addicted to anti-depressants and completely insane. I can get behind such a story. I'm sympathetic to mental illness and depression is the least of Marc Spector's (aka Moon Knight's) problems; more problematic is his multiple personality disorder. BUT, there's one scene in which Spector is shown punching Marlene, his supposed love interest. I believe in second chances, a shot at redemption, but there are lines we personally draw, and that's one of mine. I found it exceedingly difficult (impossible so far) to get behind such a character. Plus, he's supposedly gotten his powers from an Egyptian moon god who reveals himself to be detestable in his own right. One wonders if the fact that the god has thus far targeted supposed bad people is not but a coincidence. Is Moon Knight supposed to be a hero or not??? We've gone down such roads questionable roads before (Daredevil, Punisher, and so on), but Moon Knight—at least in this volume— is even less supportable. On top of the morality of it all, the insanity (which is so hard to do well), makes the book very confusing at times as we grapple to know what is really happening and what isn't. Canadian artist, David Finch's work, is gratuitous, with little more innovation than that.